Already have a robotic vacuum, a robot lawn mower, a robotic pool cleaner? how about a robotic window cleaner? Ecovacs Robotics has a new window cleaning robo-assistant called Winbot 7 on display now on the CES trade show in Las Vegas, which can cut another one of those pesky household chores. During CES 2013 Ecovacs Robotics displayed a new type of robotic assistant. Externally it doesn’t look very different than many existing vacuum robots (perhaps slightly smaller) but on a closer look you can easily see that this is a new type of machine. The Winbot 7 is actually a new and improved version of an older model developed by Ecovacs which required a magnetic unit on the other side of the window to help keep it in place. 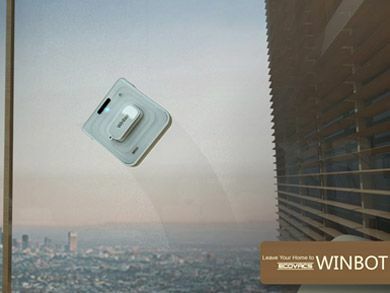 As an alternative, the Winbot 7 is based on 2 suction rings powered by a powerful motor which keeps the robot clinging to the window. Using the Winbot 7 is supposed to be a simple process. Put it on the window and connect its long cord to the socket, the second the robot creates a strong seal, it will let you know by flashing a color LED. Next, the Winbot 7 will move around the window and try to calculate its size and then it will start and move more efficiently to clean the entire window using a special pad soaked in a cleaning solution. Although the Winbot 7 uses a cable for power as well as for security proposes it also has a three hour backup battery which kick into action if the power is down from some reason. The 4.5 pound Winbot 7 can clean all sorts of flat surfaces including all type of windows and mirrors. The Winbot 7 should be available for purchase around April 2013 for about 400-500 dollars. More information on the Winbot 7 can be found on the Ecovacs Robotics website. TFOT covered all sorts of house robots including a solar lawn mower robot, kitchen-cleaning robot, created by the California-based Readybot Challenge and even the iRobot Looj which was on display at CES 2009 and cleans gutters automatically.